Special Containment Procedures: Instances of SCP-478 are to be surgically recovered whole from victims before death. After recovery, they are to be kept in specialized vacuum-sealed lockers within Bio-Site 66. Instances of SCP-478 do not seem to be able to pass through solid matter, and thus may be held indefinitely unless damaged. Mildly affected victims may be treated in a normal civilian medical establishment by Foundation surgeons under the guise of orthodontic surgery. General sedation is to be administered, as per normal surgery. Severely-affected victims of SCP-478 are to be recovered by the nearest Foundation establishment and subsequently moved to Bio-Site 16 for study. Because of SCP-478’s unique structure, infected individuals are not to be terminated prematurely. Victims deemed capable of full recovery may be treated for infection and released, as above. Survivors are to be administered a Class-B Amnesiac and false memories are to be planted. Victims deemed unsalvageable may be terminated. Description: SCP-478 are small entities of inconsistent size and shape that resemble a darkly-coloured butterfly or moth in flight. Wild instances have been encountered a number of times, but their elusive nature makes capture difficult. Extracted instances of SCP-478 do not seem to need to eat, sleep, breathe, or breed. After some testing with captured instances, it is understood that SCP-478 are somewhat predatory and normally prey exclusively on humans under the age of 25. Furthermore, SCP-478 most often seeks out individuals who have not yet shed all their deciduous teeth. Civilian treated and released, instance 478-34 recovered. SCP-478 will enter a victim’s mouth while they sleep, and attach onto the soft palate in the upper nasal cavity, usually blocking one nostril. The body’s mucus production will increase, leading the victim, upon waking, to believe that they have developed a minor cold. From there, the victim’s palate will begin to generate teeth in addition to the gingiva's (gums) normal replacement of teeth. This growth process will begin at a rate several times faster than normal tooth growth, and quickly increases in speed and severity. The palate’s generation of new teeth will continue until the entire palate has been covered, proceeding down the victim’s throat and esophagus. Over the course of two to four days these teeth will completely saturate the stomach lining, then begin growing within the lungs and the subcutaneous layer of skin. Skeletal calcium will be leached away to provide material for the new teeth, in an increasingly painful process. This growth will continue until the entire digestive tract has been saturated by dental tissue, after which SCP-478 will exit the victim's mouth and flee. Teeth within the stomach are exposed to the body's normal acid production, while teeth within the skin will group closely together, forming rigid masses of dental material underneath the surface. All teeth are normal beyond placement, containing a root, nerve and enamel. 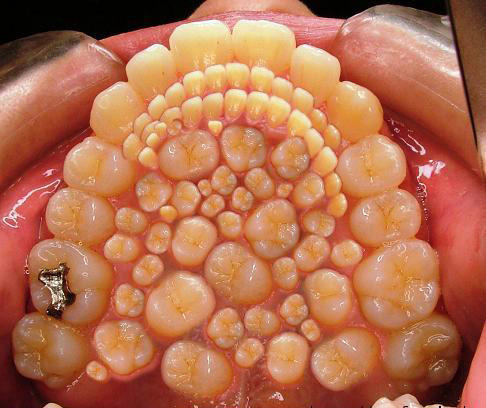 It is unknown exactly how or why SCP-478 cause this explosive new growth of dental tissue. Documentation recovered from Foundation raids on the dental laboratory of Dr. Rasmin Yelkov implicate SCP-478 as a primary source of the phenomenon observed in SCP-1994. Investigation into Dr. Yelkov's ability to communicate and capture instances of SCP-478 is ongoing.